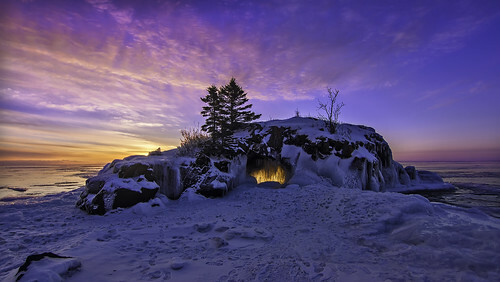 Winter Hollow Rock is an iconic tombolo island located just south of Grand Portage Minnesota on Lake Superior about 10 miles south of the Canada border. It's one of the few sea arches along Minnesota's North Shore that’s easy to access from land on property owned by The Hollow Rock Resort. In February the sunrise lines up behind this little island - and if the sky is clear - and if the arch isn't plugged up with ice - and if there is open water to reflect the light - and if you stand in the right spot at sunrise - the open area glows this bright yellow color like it's on fire for about 5 minutes . . . cool!